Governor Adams Oshiomhole of Edo State, is currently battling for survival after a horrible auto crash which his aides noted that is not serious. Some sources within Government House claim that the governor was flown to London to get treatment in an undisclosed hospital. According to the reliable sources, contrary to the facts stated by his media aide, Kassim Afegbua, that all was well with the governor; in reality he sustained serious injuries on his head as well as pains in his heart. It has been gathered that Mr. Oshiomhole was first attended to in the government house by his doctor of physiotherapist and medical doctor, but he never responded well to immediate treatment, hence he was promptly flown out in secret. Journalists have been making frantic effort to get the true story after it was broken exclusively yesterday by a London based media, Elombah.com, but they have made no headway. A source who spoke to the Paradigm correspondents queried why the government is scared of showing the world the pictures of the car which carried the governor on that fateful day if the car was not badly hit. When The Paradigm contacted another official source within the government house, it said the governor was hurriedly flown to the United State in a chartered air ambulance. However, the source preferred to remain anonymous. Next articleURGENT MESSAGE FOR GOV. AMOSUN: Over 20,000 People Will Lose Home In Few Hours, Please, Help! wen is dis rubish goin 2 stop in dis country,r there no hospitals in nigeria or r d doctors nt gud enough..i wonder wen al dis wud stop…god help nigeria.. 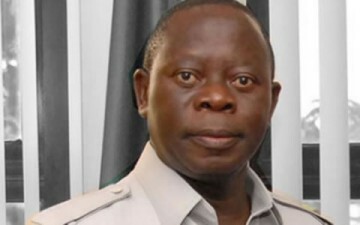 I wish him(Oshiomole) a quick recovery. I wish you quick recovering my amiable comrade governor. You heal in Jesus name. hap new year 2014 i pray God wil heal u in jesus name. THE GOVMENT HAS COMMITED A HUGE PROGRESS IN DA NATION BY PROVIDING BAD ROADS, TRANSPORTATION PALAVA,NO PIPE BURN WATER,1% GUD HOUSING 4 ALL,O% STABLE POWER,NO JOB SECURITY.NO WELL EQUIPT HOSPTAL & NOW NATURE IS GIVING THEM BACK THEIR DIDS & ALL THEY CAN TINK OF IS FLYING ABROAD WIT OUR MONEY 4 A PAFECT MEDICAL CHECK UPS ABI?LETS SEE IF THEY CAN BUY A SECOND LIFE 4RM GOD. If the gov did not sustain a serious injury, why fly out of the country. Or is it another means to embezzle state money. Oshimole was very critical of govt officials that travelled overseas for treatment when he was the labour leader. Now what are we seeing. What a big, fat and white lie. Oshiomhole is currently in Dubai having d fun of his life. Naughty Politicians!! I WISH GOVERNOR ADAMS OSHIOMOLE QUICK RECOVERY IN JESUS’ NAME. WHAT HAPPENED TO HIS CAR IS UNCALLED FOR AND UNEXPECTED. SUCH CAN HAPPEN TO ANYPONE. SO, NO ONE IRRESPECTIVE SHOULD REJOICE @ THIS. LET US PRAY FOR HM. God bless Nigeria. Wishing him very quick recovery. May the Good Lord grant the Comrade Governor a quick recovery in Jesus Name, Amen. Mocking fellow human being is never a news, its rubbish and ungodly. This can happen to anybody and one can go abroad for treatment if there is opportunities for it. Please lets learn to be our brother’s keeper knowing fully well that what happens to Mr A today can equally happen to Mr B tomorrow. May God help us. I wish him quick recovering. 2013 like a dream has come n gone never to be lived again. Let us leave behind our fears, worries, unfulfild xpectations n aspirations because God has reasons for all dat. As 2014 unfolds, we are confident that God is ever faithful. D best new year resolutn is to draw closer to Jesus, d author n finisher of our faith so that He wil perfect al dat concerns us in 2014. Happy New Year. WHISHING HIM QUICK RECORVERY, IJN. mr . governor am really sorry about your accident and the injury sustain in the process its my prayer that you recover speedily.Nevertheless am not happy about your being flown abroad for special treatment when we have very good hospitals like UBTH and SPECIALIST hospital in Edo state .what did i hear you say its not good enough to treat your case!then do something fast about them, and bring them to the very standard that every one expect.